Snap High Back Chair with lumbar back support "Pillows; Back: 19"W X 17.5"H with 3" adjustment; sculpted seat: 19"W X 19"D X 16-21"H; Base: 24" molded reinforced nylon standard with carpet casters; Black Shell Only. Standard fabric color black. Other fabric colors are available. WEIGHT CAPACITY 250 LBS. 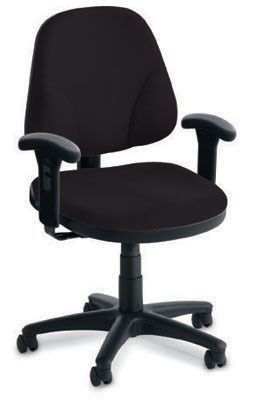 Standard with tilt function; Seat: 10 degree tilt; 19"W X 19"D X 16-21"H; Back: 20 degree angle adjustment; 19"D X 17.5"H with 3" adjustment; Base: 24" molded reinforced nylon standard with carpet casters; Black Shell Only. Standard fabric color black. WEIGHT CAPACITY 250 LBS.